Previously on Supergirl: A crossover event happened, but we’re mostly ignoring that, as we are wont to do. Previously previously on Supergirl, Mon-El returned, bearded and more boring than ever, and Kara was sad about the fact that he’s married to some lady now. Sam Arias discovered her evil Worldkiller destiny in a desert Fortress of Solitude, and became “Reign,” which is the title of this episode so I assume she’s gonna have a big part in it all. That’s it, let’s get this midseason finale over with! Sam wakes up without her Reign powers and Ruby runs into her bedroom, saying that she heard her mother scream. The conversation Sam has with Ruby tells us that not only does Sam not remember finding her Fortress of Solitude and gaining evil superpowers, but she doesn’t even remember going on her little self-discovery trip into the desert at all. We don’t get any clarification of what she remembers from visiting her adoptive mother but I assume she has no memory of seeing the spaceship or even getting shot and wanting to find answers in the first place. Meanwhile, Mon-El is telling the DEO about what life in the 31st century is like. Technology is super advanced, but it’s used for the same stuff we use it for: communication, entertainment, and killing. I also learn that Imra is just as boring and bland as her husband. Judging by these two alone, I suspect that technology in the 31st century is used for something other than communication, entertainment, and killing, and that “something” is sapping the charm from every living thing on Earth. Mon-El and Imra are part of a future peacekeeping group called the Legion, modeled after Supergirl’s history of morality and goodness. Side note: in several versions of Superman lore, Superman doesn’t die of natural causes — he just lives forever; does the same not happen for Supergirl? Or did Future Kara die of unnatural causes, and was forgotten during the thousand years between now and Imra’s future? According to Mon-El, the future is full of “bad things” (what a wordsmith) and Imra says “the darkness” (yikes, these poets deserve each other) that the Legion fights against is spreading. While on one of their missions, their ship got knocked into a wormhole and thrown 12,000 years into the past. Since the time travel was accidental, they couldn’t just go home, so they did what I always do when faced with a difficult task that might take a while to finish: they went to sleep. Mon-El woke up early and we know what happened after that. Now that we’re all caught up, the meeting adjourns and the DEO promises to help Mon-El and Imra get back to their time. Kara awkwardly invites them to her Christmas party, which they decline. During said Christmas party, cute stuff happens: J’onn extolls the virtues of Hall and Oates and Empire Strikes Back, Kara and Alex have a moment of mutual self-pity, and Alex chats with Ruby about the time she dove backwards off a building during a shootout and Supergirl caught her. Less cute, more confusing stuff happens as well, such as the ongoing flirtation between Lena and James (why?) and Kara calling Sam, a woman she only recently had a full on-screen conversation with, her “best friend” along with Lena. I know I keep harping on this in my reviews, but jeez does this show not know how to write friendships well. Festivities are cut short when J’onn informs Kara that Supergirl is needed. They have the fiery equivalent of a crop circle which, when Supergirl flies up to get a bird’s-eye view, takes the shape of what we know to be the symbol that was on the uniform of the lady who gave Sam her powers. The same symbol shows up throughout the city but, though she knows it’s something to do with Krypton’s ancient history, Kara doesn’t know what it means. James and Lena go see Morgan Edge, since they think the symbols are another one of his scare tactics. Kara and Winn go to the alien bar to ask around about the symbols, but they run into Mon-El and Imra flirting via... chicken wings? What is wrong with these two? More awkwardness ensues. Kara is saved by a call from jail, and she goes to meet with that crazy cult leader from a few episodes back. He’s reciting verses, but not from the Book of Rao. He mentions “Worldkiller” and the end of days, a prophecy from before the Book of Rao that speaks of a “dark god” whose symbol is the one showing up everywhere. He knows all this because he went around the world finding Kryptonian artifacts, and I guess one of the things he found was the script to this episode. Is this show seriously trying to say that the AI with all the accumulated knowledge of Kryptonian history didn’t know about the ancient, world-ending devil of their mythology, but some random Fort Rozz priestess could fill some random crazy human in on it all? I ain’t picking up what you’re putting down, Supergirl. Also, the extreme close-ups in this scene are really weird. Lena and James still think Edge has something to do with the symbols, and while following a potential lead they get attacked by a guy with a laser gun. James saves them with his Guardian shield; they both assume the attack was an assassination attempt on Lena. This scene clumsily cuts directly to a gang drug deal going down, and all the gang members getting attacked by an unseen force. After checking in on Lena and James, Sam hears the report of the gang attack on the news. She goes into a sort of trance and walks away, opening her shirt to reveal the Reign symbol on a uniform underneath. I know she forgets what she does as Reign, but how did Sam not notice she was wearing a shirt under her shirt? The gang attack confirms, by the use of heat vision, that the person creating the symbols and killing people is Kryptonian. Kara doesn’t buy into the idea of this person being a world-ending dark god, however, and simply vows to beat her down like any other opponent she’s ever had. When Reign attacks Morgan Edge, Kara decides it’s time to deal with this Kryptonian threat on her opponent’s terms, rather than continuing their fruitless search. Kara heat-visions her “S” symbol into the roof of the CatCo building. Uh... okay, but what if Reign doesn’t fly over the CatCo building, Kara? Couldn’t you just do a press conference instead? It probably would’ve helped to curb the smear campaign Morgan Edge begins immediately after the attack, hinting that it was Supergirl who tried to kill him. But Reign does answer Kara’s call. A huge fight happens, sending the two Kryptonians smashing through the city as citizens look on in wonder/terror. Although Kara puts up a valiant effort, it’s evident — through the appearance of actual wounds and signs of exhaustion on Kara, but very little on Reign — that she is losing the battle. She continues to fight for as long as she can, but after a series of blows in the street, Reign and Kara end up on the roof of another building. 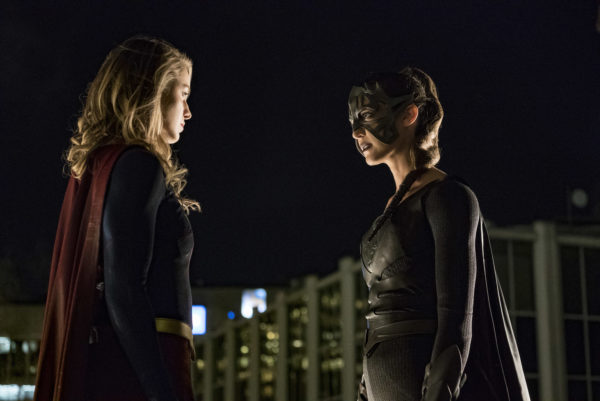 This time, Kara is too worn out to fight against Reign, who tosses her off the building. She falls hundreds of feet, to land in a broken heap on the concrete below, surrounded by people who are probably having a really bad Christmas Eve, considering they just witnessed the apparent murder of their city’s sworn hero. Kara isn’t dead, though. She’s taken to the DEO and Alex fights to save her, but still. Things aren’t looking too good. The final scene of the episode is at Sam’s house. Ruby wakes on Christmas morning and finds her mom standing strangely, facing away from her. She turns around, but the episode ends before we can see whether the person with Ruby is Sam, or Reign. “Jimmy, I get the feeling your dislike for me is more than just purely professional.” “You get feelings?” Heh. Sam says the Supergirl/Superman “S” symbol means “stronger together” but... no? I’m pretty sure the “S” symbol in Supergirl canon is a sign for her family crest and might also mean hope, but I don’t think “stronger together” was ever established. Lena and James are a thing now, I guess.